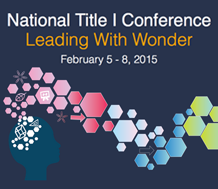 Register for the 2015 National Title I Conference, February 5-8, at the Salt Palace Convention Center in Salt Lake City, Utah. WestEd’s Lenay Dunn and Carlas McCauley will present at this national conference focused entirely on Title I issues. Participate in their sessions and visit booth #316 to learn about our services, research, and resources. Session: What Contributed to Successful (or Not As Successful) SIG Turnaround Efforts?